In recent years, Congress has shown remarkable leadership in energy innovation policy. Rejecting the Trump administration’s recommended cuts, lawmakers instead boosted funding for research, development, and demonstration (RD&D) in renewable energy, energy efficiency, carbon capture, and basic energy sciences. They supported loan programs for first-of-a-kind projects, including an advanced nuclear plant and a clean methanol production facility. And they are currently debating a flurry of bills to create new programs to accelerate innovation in energy storage, atmospheric carbon removal, and advanced nuclear power. The Trump administration has once again proposed massive cuts to energy RD&D, this time in its recently released fiscal year (FY) 2020 budget request. The Department of Energy’s (DOE) RD&D budget would be slashed by more than 40 percent, from $7.3 billion in FY 2019 to less than $4 billion in FY 2020, to its lowest inflation-adjusted level since the middle of the George W. Bush administration. As a share of the economy, federal energy RD&D would reach its lowest level since the creation of DOE in 1978. Lawmakers should not give this year’s budget proposal any greater credence than they have given the last two, wherein Congress emphatically rejected draconian cuts and increased energy RD&D programs by 14 percent in FY 2018 and 5 percent in FY 2019. Clean energy innovation is a win-win-win-win investment: It lowers energy costs for consumers and businesses; increases the global competitiveness of U.S. clean-tech businesses; strengthens energy security and resilience; and reduces pollution, including greenhouse gas emissions that cause climate change. This report first describes the key role of the federal government in the U.S. energy innovation system. It then provides a high-level overview of both DOE’s overall budget and its RD&D budget. The bulk of the report drills down into the programs and subprograms that make up DOE’s RD&D budget, detailing what would be put at risk by the administration’s proposed cuts, and opportunities that might be realized through expansion. Public investment and private investment play complementary roles in the commercialization of new energy technologies. The private sector is very good at improving mature technologies and developing nearly mature ones into marketable products. It does so in response to considerations such as competitive advantage, time to market, return on investment, and other economic incentives. Industry is the primary innovator in the United States, accounting for approximately 69 percent of total research and development (R&D) spending. However, industrial innovation is by nature incremental and focused on relatively short-term payoffs. The U.S. energy industry invests a very small share of its revenues, just 0.3 percent, in R&D. That is far less than the 8.5 percent R&D-to-revenue ratio found in aerospace and defense, 9.8 percent in computers and electronics, and even 2.4 percent in autos. The American Energy Innovation Council (AEIC), a group of 14 of the nation’s prominent corporate leaders, has made a detailed analysis of the challenges that limit private-sector innovation in the energy sector. These include high capital-intensity and long payback periods for investments. Even venture capital (VC) funding, which tends to be less risk-averse than other sources of private capital, favors payback times and returns on investments that make it a poor match for the cleantech industry. In addition, because energy is valued as a commodity—i.e., there is no tangible difference in the electricity that comes from a coal plant versus a wind farm—emerging technologies often cannot distinguish themselves from incumbent technologies and must therefore compete on price and performance from the moment they enter the market. Electric utilities are often legally mandated to keep prices low and are prohibited from investing in new technologies. The federal government is uniquely suited to address these barriers, making high-risk, long-term investments the private sector is simply unwilling to fund. Indeed, ITIF has found that federal investment frequently serves as a catalyst for industry, as government RD&D tends to attract rather than crowd out additional private RD&D dollars. Accelerating energy innovation requires a suite of policies acting together across the innovation spectrum (figure 1). For technologies that are far from commercialization, public investment in basic and applied research and technology development is necessary to improve the performance and drive down the cost of emerging technologies to the point that entrepreneurs and corporate R&D units jump in. As technologies mature, successful demonstration at commercial scale may be necessary to establish cost, reliability, and performance characteristics and provide confidence to more risk-averse investors and the public that the technology works as intended. Additional tools such as loan guarantees for first-of-a-kind commercial projects and “market pull” policies such as tax incentives and clean energy standards can bring technologies further down the cost curve. Public investment as a share of the total spent on each technology generally declines as it matures, from full public support for basic research to significant levels of private-sector cost-sharing in the development and demonstration stages to fully private funding of large-scale deployment. As the nation’s largest funder of energy RD&D, DOE fills a foundational role in the U.S. energy innovation ecosystem. Many of the technologies currently making major contributions to both the U.S. and global energy systems received DOE support along the way (See box 1). The shale gas revolution example illustrates the synergies of “technology push” and “market pull” policies working in concert to shepherd a new technology to market. Beginning in the late 1970s, the federal government funded fundamental research in directional drilling and shale resource characterization, countenanced and funded industry-wide collaboration in applied RD&D that might otherwise have drawn antitrust scrutiny, and subsidized industry-led demonstrations of the first horizontal wells in West Virginia and Texas. This technology push overlapped with a time-limited market-pull production tax credit for wells drilled between 1980 and 1992, with production eligible for the credit through 2002. By 2002, when federal support tapered off, shale gas had grown to account for 2 percent of domestic gas production and was able to compete in the market on its own. Since then, hydraulic fracturing technologies, combined with vast domestic shale resources, have enabled shale gas to grow to 70 percent of domestic production. Congress has filled critical gaps in the energy innovation ecosystem through the establishment of ARPA-E and clean energy manufacturing innovation institutes, and by funding technology demonstration projects. It has also sought to build tighter linkages between DOE’s national laboratories and innovators in private industry. These hard-won gains have been threatened by the Trump administration, whose budget for FY 2020 would not merely reverse Congress’s efforts to strengthen the U.S. energy innovation system, it would put the whole system at risk. Congress has definitively rejected the administration’s approach in the last two budget cycles, instead providing a large boost to energy RD&D in FY 2018 and a more modest increase in FY 2019. Congress should reject the administration’s FY 2020 budget proposal, elevate energy innovation as a national priority, and continue to expand federal funding for DOE’s energy RD&D programs. The name “Department of Energy” may leave the mistaken impression that DOE’s primary function is overseeing and improving the nation’s energy innovation system. In fact, when the other activities of DOE—defense, environmental cleanup, and non-energy-focused basic science—are taken into account, only $7.3 billion, or 20 percent of DOE’s budget, supports energy innovation (figure 2). DOE was created in the late 1970s at a time when energy demand was increasing rapidly, energy prices were high, and OPEC was flexing its muscles in global oil markets. Energy innovation and the development of domestic clean energy were viewed as matters of economic and national security. In 1978, Congress invested nearly $10 billion in energy research (in 2017 US$) at DOE, or more than 2 percent of non-defense discretionary spending. But as energy prices declined, energy innovation receded as a national priority—and funding for energy RD&D has not kept pace. Total funding hovered below $4 billion for most of the mid-1980s through the early 2000s (figure 3). In 2007, the National Academies released its groundbreaking report Rising Above the Gathering Storm, which examined U.S. leadership and competitiveness in science and technology. The report concluded that without increased RD&D investments, the United States risked falling behind other nations—particularly in clean energy innovation. In response, Congress passed the America COMPETES Act of 2007, which authorized a doubling of RD&D funding at DOE and other science and technology agencies. The doubling goal was reaffirmed in the 2010 reauthorization of COMPETES, and again at the launch of Mission Innovation in 2015. However, actual appropriations have not matched these funding targets, and the United States remains far short of its original goal of doubling energy RD&D funding by 2021. Yet the administration’s budget proposal for DOE targets energy RD&D for its largest cuts. Figure 4 compares DOE’s budget in fiscal year (FY) 2019 with the president’s FY 2020 request. The president proposes a $1.5 billion increase in defense programs, while cutting environmental cleanup by 10 percent and basic science by 13 percent. The budget for energy RD&D would be cut by 48 percent, from $7.3 billion to $3.8 billion, which would reduce energy RD&D to its lowest level in real terms since 2005. 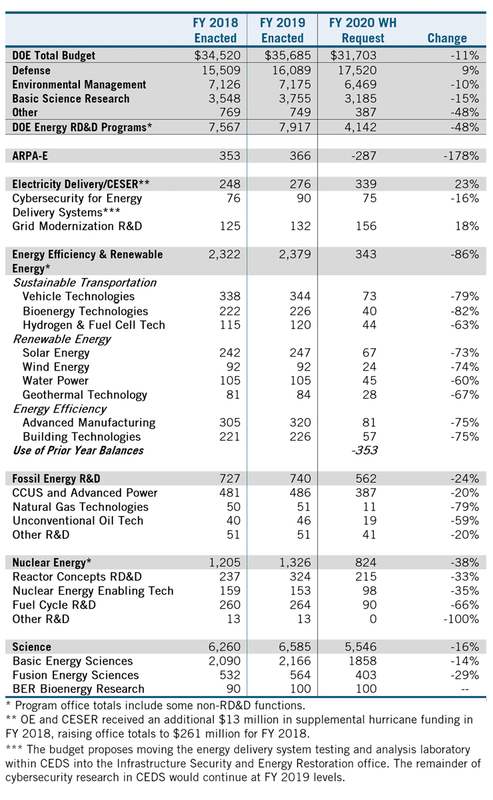 The FY 2020 budget request, if enacted, would result in the largest single-year decrease in energy RD&D in DOE’s history, and reflects a fundamental skepticism of the federal government’s role in energy innovation. It is based on two flawed rationales: first, that the private sector will pick up the slack if the federal government withdraws from mid-and late-stage energy technology RD&D; and second, that the success of certain technologies that have seen dramatic price reductions in recent years—such as wind power, solar power, and electric vehicles—means federal action to spur further energy innovation is no longer needed. The evolution of solar photovoltaic (PV) technologies similarly exemplifies the role of smart public policy in accelerating innovation and the synergistic interactions between public and private investment. In the 1970s and 1980s, government and university R&D was responsible for most of the performance improvements and cost reductions in solar PV modules. During this time, the nascent solar industry was supported by the emergence in the public sector of niche applications—primarily for use in satellites—at NASA and the Defense Department that were relatively insensitive to cost. As the technology matured and the solar industry expanded, pull policies such as tax incentives, net metering, feed-in tariffs, and state portfolio standards helped expand the market for solar and also incentivized greater private-sector investment, which enabled the industry to take advantage of economies of scale. In 2011, the DOE Loan Programs Office provided loan guarantees to the first five utility-scale solar PV facilities larger than 100 megawatts (MW). Thanks in large part to these policies working together in the United States and globally, the cost of solar PV panels has declined by 99 percent over the last four decades. The Office of Management and Budget (OMB) has directed agencies to focus RD&D spending on early-stage research and has issued guidance that “federally funded energy R&D should continue to reflect an increased reliance on the private sector to fund later-stage research, development, and commercialization of energy technologies.” The request therefore falls most heavily on the applied research, development, pilot, and demonstration projects. Public support for emerging energy technologies is needed across the innovation spectrum in order to address market failures that typically block emerging energy technologies from reaching full maturity. Additionally, many studies have found that public investment in energy RD&D acts as a catalyst and accelerant for private RD&D. DOE itself finds that “[DOE investment] is most effective when it complements private investment, i.e. when [DOE] outputs create productive investment opportunities for the private sector, thereby crowding in private investment.” Unfortunately, the converse is also true: Reduced public funding will likely lead to fewer opportunities for private-sector investment in new energy technologies. Analysis by Matt Hourihan of the American Association for the Advancement of Science found that declining federal energy RD&D investment during the early 1980s contributed to decreased private RD&D in advanced energy technologies. Energy Secretary Rick Perry and other senior DOE officials have pointed to the success DOE programs in wind and solar energy have had in driving down costs as justification for budget cuts. While (onshore) wind and solar PV have seen dramatic and rapid cost reductions in recent years, they are still not yet competitive without subsidies in most parts of the country. More important, other emerging technologies—including offshore wind, concentrating solar power, marine and hydrokinetic power, enhanced geothermal power, algal biofuels, advanced small modular reactors, and many other clean technologies—are still far from matching the reliability and low costs of conventional technologies. Yet, these are the technologies that are targeted for the most severe cuts. Technology demonstration projects pose one of the most difficult challenges in energy innovation policy, and not all end in success. The FutureGen carbon capture and sequestration (CCS) project is one such example. First proposed by President George W. Bush in 2003, the FutureGen 1.0 project was designed to demonstrate integrated gasification combined cycle electricity generation, CCS, and hydrogen production at the same site in Mattoon, Illinois. The challenge of integrating multiple new technologies at commercial scale proved costlier than originally planned, leading the Bush administration to shutter the project in 2008. In 2010, the Obama administration revived the project as FutureGen 2.0, retaining the sequestration component of FutureGen 1.0, but calling for retrofitting an existing coal plant in nearby Meredosia, Illinois, with oxy-combustion technology. By 2011, competition from low-cost gas-powered generation resulted in the closure of the Meredosia coal plant. Challenges in securing private financing to complete construction, difficulties in obtaining environmental permits for underground carbon sequestration, and decision-making delays at DOE headquarters also contributed to the final decision to pull the plug in 2015. A third rationale recently offered by Acting Office of Management and Budget Director Russ Vought is that the government cannot afford to invest more in innovation when it is already running at a budget deficit. However, history has shown that federal investments in energy RD&D have paid for themselves many times over in the form of lower energy costs for consumers, fewer energy imports, avoided pollution, expanded entrepreneurship, and improved competitiveness of U.S. businesses. By many measures, the United States is significantly underinvesting in energy innovation. At the current pace, the nation will fail to meet the climate- and competitiveness challenges of the 21st century. The recent National Climate Assessment and the Intergovernmental Panel on Climate Change’s report on Global Warming of 1.5 Degrees Celsius point to the need to rapidly accelerate the clean energy transition. Yet both global and U.S. carbon dioxide emissions increased in 2018. The uncomfortable fact remains that clean energy technologies cannot yet match conventional fossil-fuel-based technologies in price and performance. Patent applications in clean energy have declined in recent years as well, suggesting public investment is too modest to “crowd in” private investors who would seek patent protection. ITIF analysis has also identified major gaps in the federal energy RD&D portfolio, particularly from harder-to-abate sources of carbon pollution. There are warning signs that U.S. competitiveness in the global clean energy industry is at risk. Eleven other countries—including China—invest more in energy RD&D as a share of their economy than the United States (figure 5). As other countries have stepped up their investments in clean energy, the share of cleantech patents granted by the U.S. Patent and Trade Office to U.S. companies has declined, from roughly 50 percent in 2001 to less than 40 percent in 2016. For these reasons, many prominent government and industry leaders have recommended doubling or even tripling federal funding for energy RD&D. In 2018, the corporate leaders who comprise AEIC called for a federal energy RD&D budget of $16 billion annually to bring this sector closer to other advanced technology sectors. In a January 2019 report, the Energy Futures Initiative (EFI), led by former Energy Secretary Ernie Moniz, noted that investing in energy RD&D at a level proportional to the current value of the energy industry to the economy ($1.37 trillion) would raise government investment to $12.5 billion per year. Figure 6 displays the distribution of funds across this portfolio, with programs aggregated into groups according to the DOE office that manages them. The bulk of the funding lies in DOE’s applied energy offices: Energy Efficiency and Renewable Energy (EERE), which houses the programs in renewable energy, sustainable transportation, and energy efficiency; Electricity (OE); Cybersecurity, Energy Security, and Emergency Response (CESER); Fossil Energy (FE); and Nuclear Energy (NE). Within the Office of Science (SC), Basic Energy Sciences (BES), Fusion Energy Sciences (FES), and a small portion of Biological and Environmental Research (BER) that supports the bioenergy research centers are also included in DOE’s energy RD&D portfolio. ARPA-E is a stand-alone, semiautonomous agency that advances cross-cutting research in high-potential, high-impact energy technologies that are too early for private-sector investment. DOE-funded RD&D through these programs has already generated a significant return on investment. A retrospective assessment by the National Academies found that DOE investments in RD&D have helped keep energy costs low while at the same time reducing pollution, creating new business opportunities for the energy industry, and decreasing U.S. reliance on foreign oil and other energy imports. More recently, an external review of energy efficiency and renewable energy RD&D programs at DOE found that taxpayer investments between 1975 and 2015 totaling $12 billion yielded more than $388 billion in net economic benefits, a remarkable return of over $32 for every federal dollar invested. And ARPA-E’s high-risk/high-reward ventures are already yielding big returns, including the formation of 71 new technology companies that have attracted more than $2.6 billion in private-sector follow-on funding. But not all RD&D projects end in the successful commercialization of new technologies. Demonstrating complex systems, in particular, has proven especially challenging, prompting calls to reform how DOE manages demonstration projects (box 3). Figure 7 displays the proposed changes by DOE program offices. The proposed cuts would hit ARPA-E and the applied energy programs hardest, with ARPA-E being completely eliminated. Additionally, the budget would rescind $287 million in previously appropriated funding, taking advantage of ARPA-E having been slow to spend all the funds appropriated to it by Congress for FY 2018 and FY 2019. The Government Accountability Office found that the Trump administration had deliberately and unlawfully withheld ARPA-E from spending its FY 2017 appropriation—and this pattern may have been repeated in the last two years. The Natural Resources Defense Council found that, as of December 10, 2018—more than two months after the end of fiscal year 2018—ARPA-E had been unable to spend some $280 million (79 percent) of its $353 million FY 2018 research budget, and had not even begun to spend its FY 2019 RD&D budget. The budget request for the energy efficiency, renewable energy, and sustainable transportation programs within EERE is identical to the president’s proposal for FY 2019, with cuts ranging from 57 percent for water power to 82 percent for bioenergy technologies. However, the FY 2020 EERE budget makes use of the same budgeting gimmick being applied to ARPA-E: It would draw on $353 million in previously appropriated but unspent funds from FY 2018 and FY 2019 to meet the FY 2020 proposed funding level of $696 million. EERE funding would decline by 86 percent under the administration’s proposal, from nearly $2.4 billion in FY 2019 to just $343 million in FY 2020. Federal investments in pollution-control technologies provide an example of the multiple benefits of energy RD&D. Prior to DOE’s coal RD&D programs, flue gas desulfurization (FGD) systems (a.k.a. “scrubbers”) were costly to build and maintain, incurred substantial energy costs to run, and produced a sludge waste that required considerable land use for proper disposal. Advancements in pollution control helped drive capital and operating costs down by nearly 50 percent, kept energy costs low, and turned the waste from FGD scrubbers into valuable byproducts such as wallboard-grade gypsum. DOE investments in FGD scrubbers resulted in over $50 billion in savings from public health benefits and lowered FGD costs, and also helped turn America into a global leader in environmental technologies. Environmental technologies and services contribute to a trade surplus, yielding net exports of nearly $27 billion annually. Although the administration’s policy often favors fossil energy, it does not spare FE, which would receive a 24 percent cut to its RD&D programs. These cuts are distributed unevenly. The largest would hit pollution-control programs, including carbon capture, utilization, and storage technologies (65 percent), and technologies to reduce methane emissions from natural gas systems (targeted for elimination). The proposal continues the administration’s efforts to revitalize the coal sector, increasing R&D spending aimed at improving the thermal efficiency of existing coal power plants and the design of new “high-efficiency and low-emission” coal-fired power plants. Notwithstanding recent Congressional efforts to jumpstart RD&D in advanced nuclear technologies, NE would be cut by 38 percent. The proposed cut comes just weeks before the reintroduction of the Nuclear Energy Leadership Act, a bipartisan bill that would refocus DOE RD&D on advanced non-light-water reactor technologies, which have the potential to play a significant role in a future low-carbon electricity system. OE and CESER are the only winners in the administration’s budget request. OE’s RD&D programs would receive an 18 percent boost overall, with most of that increase going to its transmission reliability and resilience program. CESER would get a 30 percent boost, with most of the increase going to non-RD&D programs aimed at securing energy infrastructure and providing emergency response. Within SC, BES would incur a 14 percent cut, while fusion would be cut by 29 percent. BER, which houses the bioenergy research centers, would face a 30 percent cut. For the full breakdown by RD&D programs, see table 1 in the appendix. What are the prospective benefits of DOE’s energy RD&D portfolio, and what is at risk if funding is cut per the Trump administration’s budget request? These are key questions lawmakers must grapple with as they consider how to allocate funding in the coming years. For each of its applied energy programs, DOE sets technology cost and performance targets based on the RD&D activities possible at a given budget level. As part of its goal-setting process, DOE, along with laboratory experts, assesses the ability of its program activities to improve a technology’s characteristics (e.g., capital cost) and move it closer to commercialization. In conducting this analysis, DOE assumes funding levels will remain constant over time. DOE established the Combustion Research Facility in 1981 and the Advanced Combustion Engine R&D program in 1986 to improve U.S. energy efficiency, reduce energy costs to consumers and businesses, and decrease the United States’ dependence on foreign oil. These initiatives brought together researchers at national labs, universities, and private companies such as General Motors, Ford, Cummins, Caterpillar, and General Electric. Between 1986 and 2007, public RD&D investments in these two programs totaled $931 million, while improved fuel economy resulting from these programs saved the U.S. trucking industry 17.6 billion gallons of diesel fuel, which translated into $34.5 billion in reduced fuel expenditures and $35.7 billion in health and environmental benefits from lower pollution. In other words, an investment of $931 million, over a period of 21 years, resulted in benefits of more than $70 billion, a return on investment of more than 70 to 1. Perhaps the best-known target was set by DOE’s SunShot Initiative. which seeks to reduce the average nationwide unsubsidized cost of electricity from utility-scale solar PV to $30 per megawatt-hour (MWh) by 2030. That would be below the levelized cost of electricity from a natural gas combined-cycle power plant, which was $42–78/MWh in the United States in 2017. 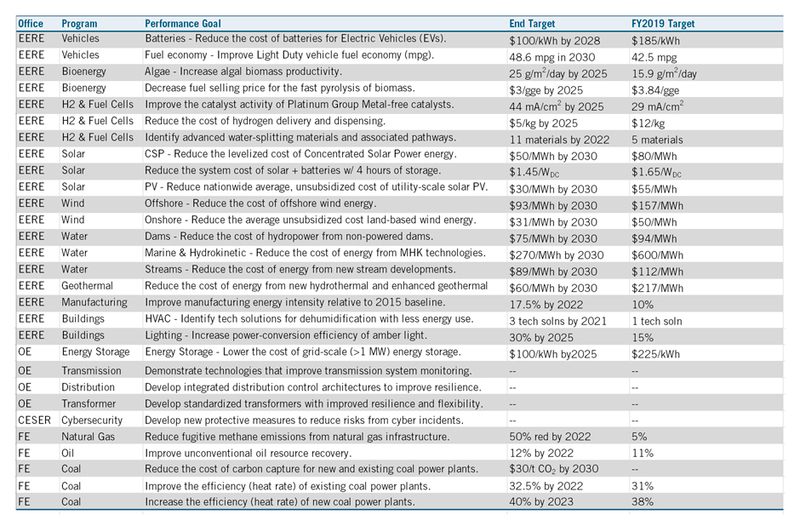 Achieving these price reductions could result in solar energy meeting 14 percent of U.S. electricity needs by 2030 (up from less than 2 percent in 2017), support 290,000 new solar jobs, and translate into $30 billion in annual energy cost savings by 2030. As Figure 8 shows, sustaining DOE’s energy RD&D programs at current budget levels through 2040 would reduce carbon dioxide emissions by roughly the same amount (12 percent) as imposing a modest but rising carbon price—but it would also cut residential energy bills by 25 percent. Doubling funding for energy RD&D, which would allow for more ambitious technology targets, would reduce CO2 emissions by 30 percent and energy bills by 34 percent. A carbon price, combined with energy RD&D, drives greater emissions reductions than either approach does on its own. The most aggressive scenario considered—doubling the energy RD&D budget and adding a carbon price—would cut carbon emissions by 45 percent. Yet, it is worth bearing in mind that, even under this scenario, the United States would still need to cut emissions by another 35 percent between 2040 and 2050 in order to hit the 80 percent target set by the Paris climate accords. Investments in DOE’s Building Technologies Office (BTO) between 2010 and 2015 culminated in the successful commercialization of 27 products across a range of energy-related technologies, including energy-efficient water heaters, solid-state lighting, and energy-saving windows. For example, the advanced dual evaporator technologies for refrigerators—which performs up to 50 percent better than conventional single-cycle refrigeration systems—was developed with assistance from BTO and successfully commercialized by Whirlpool Corporation in 2013. A retrospective assessment of BTO investments between 1976 and 2015 across three technology areas—heating, ventilation, and air conditioning (HVAC); water heating; and appliances—found that BTO investments have yielded between $6 billion and $22 billion in economic benefits, with a benefit-to-cost ratio of between 20 to 1 and 66 to 1. Because of its ability both to reduce carbon emissions and lower energy bills, expanding public investment in RD&D may be more palatable than carbon pricing to policymakers as they consider policy options to address climate change. But as DOE’s analysis has found, RD&D can also “soften the blow” of carbon pricing and other regulatory options, opening up avenues of climate policies that would otherwise be prohibitively expensive or politically untenable. Large majorities of voters across the political spectrum support more funding for research into clean energy. A December 2018 poll found that 88 percent of registered voters support funding more research into clean energy sources such as solar and wind power. The higher levels called for by groups such as AEIC would allow DOE to achieve its current technology goals more quickly and enable new RD&D programs with more aggressive goals to hasten the next phase of the fight against climate change. The drastic cuts proposed by the Trump administration would jeopardize DOE’s ability to meet its targets. The president’s budget request is only the first step in the appropriations process, while Congress makes the final disposition of funds. During the last appropriations cycle, both the House and Senate firmly rejected the proposed budget cuts, instead providing a 14 percent boost to energy RD&D in FY 2018, and a more modest 5 percent increase in FY 2019. These outcomes over the last two budget cycles were enabled by the budget agreement in February 2018 that provided a two-year abeyance of the caps imposed under sequestration. The budget caps come back into effect for FY 2020 and FY 2021, which could set up DOE’s programs for a sharp funding drop in FY 2020. The American Association for the Advancement of Science believes a more likely scenario is Congress will reach an agreement that avoids deep cuts to energy RD&D—though the prospect of future increases in energy RD&D funding is uncertain. DOE’s clean energy RD&D portfolio plays an essential role in the U.S. energy innovation ecosystem, and has the potential to accelerate the clean energy transition while also lowering energy costs for U.S. businesses and consumers. The Trump administration’s budget request would slash funding for these programs, slowing innovation and hampering U.S. competitiveness at a time when a number of indicators—including rising carbon emissions and declining clean energy patents—show the United States is significantly underinvesting in this field. Congress should reject the Trump budget proposal, elevate energy innovation as a national priority, and continue to expand federal funding for DOE’s energy RD&D programs.